The National Latina / Latino Commission (NLLC) is a non-profit organization dedicated to promoting and expanding the faith-based initiative's in the US. 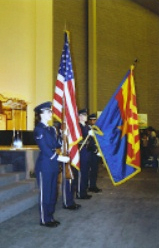 NLLC was formerly the Arizona Latino Commission, a non-profit since 1984. Rev. Eve Martinez Nunez is the Founder/President. The main purpose of NLLC is to mentor on the seven spheres of influence; family , education, business, government, arts, media, and church. It also provides information to the faith-based community about government projects that could involve faith-based services. We are a network provider-and-point of access to the faith-based and community organizations in order to facilitate these projects. In the past, there has been a gap between community projects and the faith community. NLLC commits to train the next-generation of leaders by helping them to engage in workforce development, and pursuing a higher education. In order to build a strong economic engine in America, our mentors will train youth the values of hard work. NLLC is committed to educating the Faith -Based Community about the Opioid Overdose Crisis in America and is also a brother's keeper and commits to continuing to put an emphasis on mentoring African American and Latino Youth. Churches and Faith-Based Organizations are now more open to developing partnerships with their State government agencies. Government in the past had been reluctant to get involved with the faith community out of lack of knowledge and fear regarding how people of faith operate in helping fellow citizens. The NLLC has a track record in bringing common understanding and appreciation for how the faith community and government may work together. The NLLC is a trusted network of community and faith-based organizations and leaders that understand the strength and weaknesses of FBOs and what they need to effectively collaborate with government. Being in a position of a bridge between these two worlds, NLLC is structured to receive grants and disburse funds into the faith community effectively. The NLLC is non-partisan, and non-denominational. We will serve and mentor people from every ethnic background.